Wisdom Monkeys are lucky symbols for everyone. 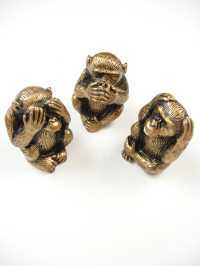 They represent wisdom and remind us: speak no evil, see no evil, hear no evil. The position of the wisdom monkeys is in the front of your desk or on top of a cabinet or book shelf.